Which ATMs in Chile offer cash withdrawals without charging a fee? I am using a Visa Debit card. My bank will not charge me fees for withdrawals, but I am concerned that the ATM's bank might. I'm currently in Chile and have withdrawn money on several occasions. So far, once I've aborted my withdrawal because the machine told me it was going to charge for my withdrawal. This, while, later, an ATM from the same bank did not charge. I've tried with 3 or 4 different banks. This suggests to me that ATM withdrawal fees depend not on the bank, but on the ATM. Note, though, that my girlfriend, who does have a card from a bank in a different country to mine, does get charged (and told she will), by ATMs that don't charge me. Granted, some of these were done with a Wells Fargo card (which also charges 5usd, whee), and some were done after finally opening a Charles Schwab account. I can try to update with others banks as I find them. Let me know of any requests. I use an ATM card from an American Credit Union that does not charge foreign exchange transaction fees. I've only found one bank in Chile that doesn't charge an ATM fee. It's Banco Security, Apoquindo 3150, Las Condes, Región Metropolitana. The location is near the El Golf Metro Stop. This ATM is only open from 9am to 2pm, Monday to Friday. There's also a Banco Security in Santiago Centro*, but the ATM has only been available occasionally when I visited. The Las Condes location always has a working-ATM during business hours. I confirm that Banco Security is still free of fees. You can find an ATM at Agustinas 621, Santiago (station Santa Lucia - line 1). The ATM is inside the agency so you can withdraw safely. I used a Visa credit card. I hope it will help ! I use a French ATM Visa Debit card and, like Brian, I was able to withdraw money without the ATM charges today from a Banco Security ATM (what a great feeling!). 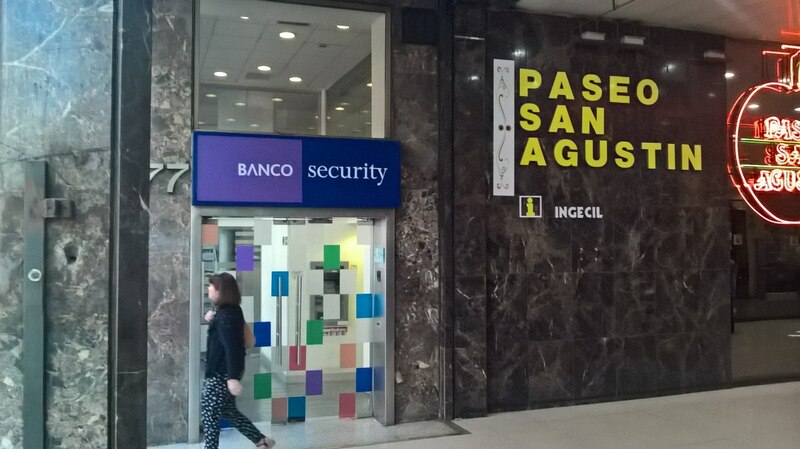 If you are near Santiago City Centre, there is a Banco Security with an ATM at the corner of Moneda and Estado streets (there's a Banco Security across from La Moneda, but it does not have an ATM). I've been told there's also a third Banco Security in city centre, but I have not had time to find it. Long story short, corroborating what Brian has said, a Banco Security ATM is what you need. Banco Estado does charge the 4000CLP fee but unlike other banks does not limit you to 200,000CLP. You can widthdraw more than that e.g. 400,000 for only a 1% hit. BICE does not have a fee. As above, Banco Internacional does not have a fee. I've been using Banco Security's ATM in Centro (Agustinas-Moneda) for the last three years, but two days ago I found that they now charge 5000 CLP fee. I didn't try Banco Security in Las Condes, but I doubt it's different. Not the answer you're looking for? Browse other questions tagged money payment-cards fees-and-charges chile atms or ask your own question.